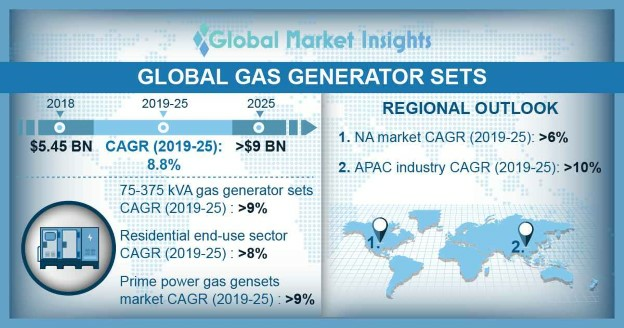 Global Gas Generator Sets Market size will surpass USD 9 Billion by 2025, as reported in the latest study by Global Market Insights, Inc.
Increasing implications for energy security, growing concerns over greenhouse gas emissions along with rising stringency of government regulations will boost the global gas generator sets market growth. For instance, the U.S. EPA sets federal minimum emissions standards for generators with an objective to minimize the amount of pollutants emitted into the air. The ability of these gensets to emit relatively lower pollutants (carbon, NOx, particulate matter) will to allow these units to occupy a sizeable share of diesel’s market share while limiting the renewable penetration to certain extent over the coming years. The U.S. gas generator sets market size is set to exceed USD 1.7 billion by 2025. The adoption of these gensets is gaining robust prominence as the shale revolution in the country has opened vast growth avenues for natural gas-fired power generation. Increased natural gas availability from shale, which roughly produces half the CO2 than coal for the same heat output, is enabling the transition toward gas-fired power generation and is consequently accelerating the deployment of these units. Industrial gas gensets market size will witness robust growth on account of intensifying regulatory pressure to enhance environmental performance and sustainability across diverse production facilities. The relative stability and competitiveness of natural gas prices alongside their lower-emission combustion will further accelerate the adoption of these units as an affordable and effective means to comply with emissions regulations with security of supply. These gensets are poised to occupy a sizeable share of diesel’s industry share while restraining the renewable penetration to an extent over the coming years. Standby gas generator sets market is set to exhibit an appreciable growth driven by progressive innovation of low-emission gas engines. Modifications in gas engines’ ability to conform with code-driven start time and load acceptance standards will drive the industry growth. The reconfiguration of gas engines for standby applications has dramatically stimulated the deployment of these gensets for electric power security majorly across commercial and industrial facilities. The UK gas gensets market will witness remarkable growth driven by rigorous environmental & emission compliances including the introduction of the EU Stage V limits. Accelerating shift of industries toward cleaner power sources including gas and dual fuel configurations will further play an influential role in the industry landscape. The demand for these units from novel applications including grid support for renewables is another evolving factor strengthening the market development. The Middle East gas gensets market is set to witness an appreciable momentum on account of ongoing expansion in the regional infrastructure and growing focus toward economic diversification. Upcoming mega projects, most notably the Dubai World Expo 2020 and Qatar FIFA World Cup 2022 will necessitate the heavy deployment of these gensets to support the backup and prime power needs. Additionally, countries including Saudi Arabia, UAE are striving toward diversifying their oil-based economy with ventures into other industries which will further impact the industry growth. Notable industry participants operating in the global gas generator sets market include Wärtsilä, Generac, Kohler SDMO, Cummins, Stemac, Briggs & Stratton, Mahindra Powerol, FG Wilson, Himoinsa, Caterpillar, Cooper Corporation, MTU, and Clarke Energy amongst others.